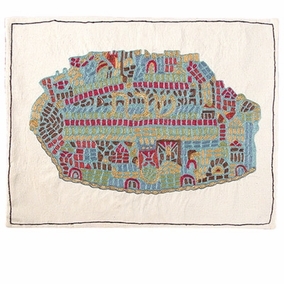 Madaba Map Challah Cover CAT# CHE-22. Chain - stitched hand - embroidery on raw cotton using various colors of silk, gold and silver threads. Size: 20" x 16". .The covering of the challah so as not to "shame" it while the wine is being blessed has been cited by many Jewish teachers as an object lesson for the importance of not shaming our fellow man as well. The following story is told about Rabbi Yisroel Salanter: Rabbi Yisroel was once stranded in Kovno for Shabbat. Everyone wanted to host him, but he chose to spend the Shabbat at the home of a baker who had no children to feed, so he would not take away anyone's portion of food.The baker was an observant Jew but hardly a man of intelligence. As he ushered his esteemed guest into his house, he shouted at his wife, "Why are the challahs not covered? How many times must I remind you to cover the challahs?" The poor woman, recognizing her distinguished guest, hurried to cover the challahs with tears in her eyes. When the baker asked Rabbi Yisroel to do the honors by reciting the Kiddush, the Rabbi first asked him, "Can you tell me why we cover the challahs?" "Of course," replied the baker. "Every child knows the answer. When there are many different foods on the table, the first blessing is always made over the bread, after which no other blessing need be made. On Friday night, however, the first blessing has to be made over the wine. In order not to shame the challah, who expects the blessing to be made over her, we must cover her over until after the sanctification of the wine." Rabbi Yisroel looked at the baker incredulously. "Why do your ears not hear what your mouth is saying?" he asked. "Do you think that our Jewish tradition does not understand that a piece of dough has no feelings and would never become embarrassed? Understand that our laws are trying to sensitize us to the feelings of human beings, our friends, our neighbors, and especially our wives!"